While making breakfast this morning, I was confronted with another culinary caper and had to share the story. 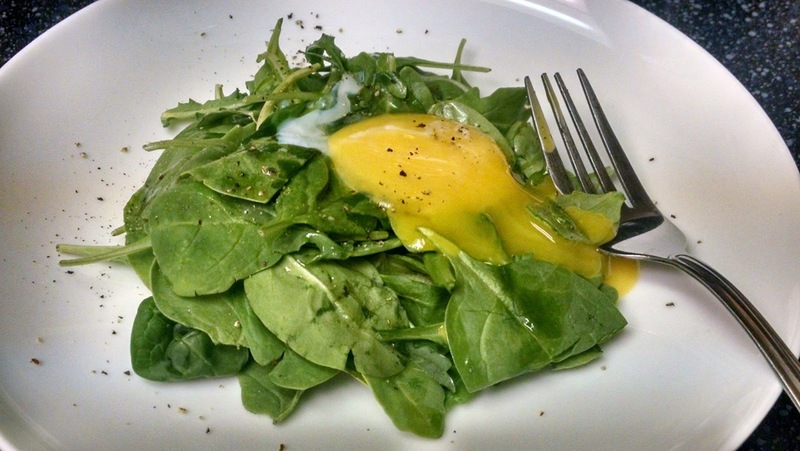 I started my morning with the plans to make a beautifully poached egg resting on top of some arugula and spinach drizzled with some olive oil, salt, and pepper. Don’t worry, I plan on covering poached eggs in an upcoming post. In order to expedite my cooking time, I decided to poach the egg in a smaller pot than what I normally use. I think I actually impeded the cooking of the egg. Perhaps I hadn’t enough coffee before I started cooking. Where’s the coffee gone? But I digress, so I slid the egg into the water to begin to cook. I give it a stir to let the egg white form around the yolk so it gets that glossy white that surrounds the yolk. Here is what a poached should look like. However, that wasn’t what happened for me. I pulled off the lid with excitement only to discover that I could see the yolk plain as day. I didn’t have a perfect poached egg, I had half of a perfectly poached egg. I reached into the pot with a slotted spoon to see what I could salvage and the remainder of whites separated like the space shuttle shedding used booster rockets. Man, this wasn’t what I wanted to have happen to my perfect breakfast idea. Now what I wondered to myself. Again, I heard in my head, well you have half of a perfectly poached egg. Then it hit me! I did my best to carefully remove as much of the lingering egg white as I could without breaking the yolk. 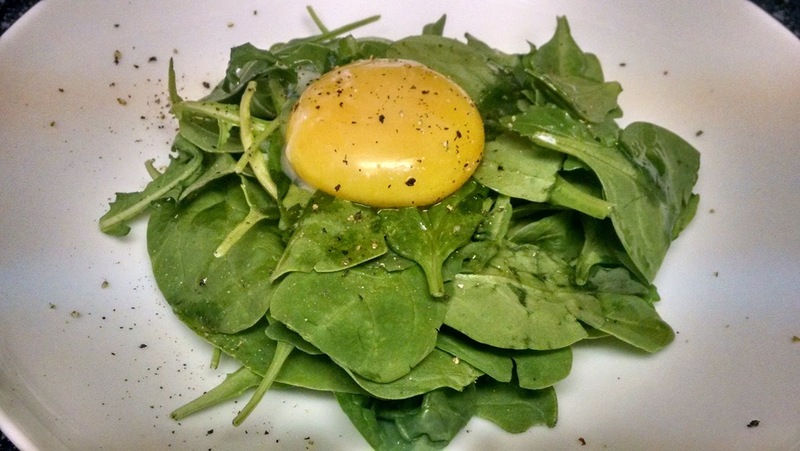 I ever so gently maneuvered my egg yolk into position on top of the waiting greens…….. Yes! 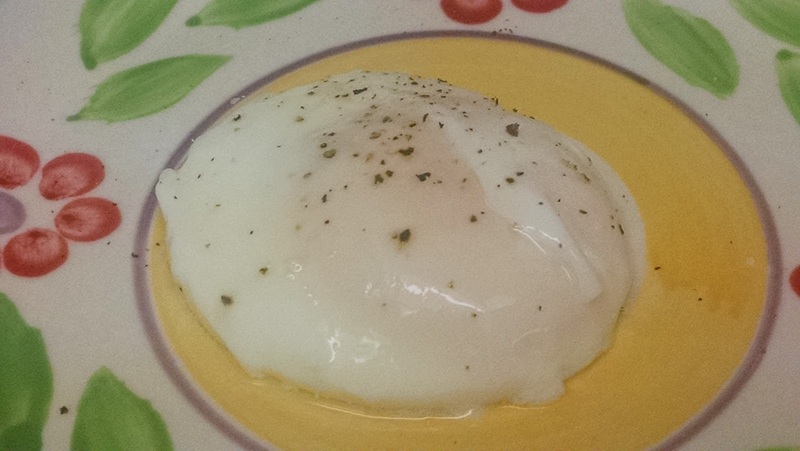 Poached egg achievement unlocked!!! Honestly I couldn’t believe how good it looked. There was only one more thing to do. That’s right. The magical flow of a perfectly cooked, runny egg yolk. It is hard to beat! Yep, I went there! How do you eat this masterpiece? Personally, I mixed it around like it was salad dressing and ate it just like that. Simply sublime. You could also load a fork full on to some good bread and enjoy thusly. So what is the moral of this post? Remember, most kitchen conundrums can be overcome with a little bit of patience and trust. In fact, I was talking with another blogger about this same idea of you have to keep going and never give up. You might like your mistake more than if you had completed the dish successfully. Plus, I love the way this looks on a plate! It just looks so cool!